If you want to publish your story, share your knowledge with the world or express yourself effectively to the readers, WordPress is undoubtedly the best platform to reach your readers. This is because WordPress provides you with convenient out of the box features that help you make the most of your content. The themes and plugins employed on every WordPress are the building blocks of any site and regulate the appearance and functionality of the website together. This makes selecting a theme for your WordPress site a critical decision. In order to help you get started with your Blogging website, we have curated a list of Best WordPress Themes for Writers. These themes offer incredible features and are best suited for your blogging website. Dedicated to enhancing editorial sites and writer portfolios, this WordPress writers theme is a highly responsive professional WordPress theme for freelancers and journalists who love to pen down their thoughts. It ensures a clutter-free experience to your readers and offers three different predefined layouts that can be installed by a single click. The elaborate theme also offers a unique homepage design to enable you to attract more readers, subscribers, and buyers. This is a result of the exclusive header and post layouts that combine together to enable an effortless design. This theme is also equipped with more than ten custom widgets, pagination options, unlimited color options, and speed optimization. Providing regular updates and supported by Genesis Framework, the Authority Pro theme is the best way to spread your knowledge to the world. If you are a writer or author who wants their thoughts to be disseminated to the world, this elaborate theme is the perfect way to share your experience and wisdom with others. Easily customizable and easier to use, this theme is equipped with exclusive theme options that let you customize even minute details of your website as per your need. It is also Gutenberg optimized and offered scope to create a flexible eCommerce store with the ever-reliable WooCommerce plugin. This highly responsive WordPress writers theme offers pleasing designs and widget areas to further highlight your content and make your writing more accessible. If you were looking to create a website for the launch of your book, then this WordPress theme for publishers is the perfect choice for you. It can help you build your ebook store for your book launch with a simple yet highly effective Drag & Drop Page Builder. It also comes with an exclusive color customizer that allows you to create your color scheme within seconds. 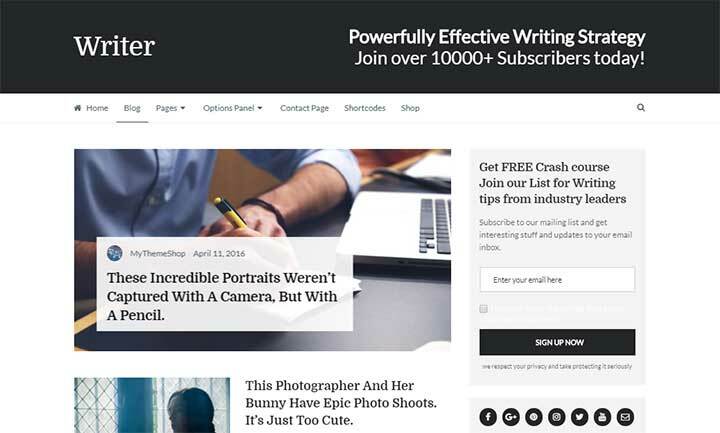 This WordPress writers theme has been designed for marketing and combines unlimited colors, typography, and graphical features to help you achieve greater sales and instant conversions. It also offers great design layouts for a specific area dedicated to Sample Book Download. The options that make it different from its counterparts include unique content blocks, drag and drop builder, fluid responsiveness, hassle-free image resizing and an advanced newsletter. SteadyIncome is the perfect WordPress theme for bloggers, online marketers, and entrepreneurs. This is because of its professional design and convenient features like ad optimization, powerful subscription tool, featured products widget, and a highly responsive design that promises a steady income for your writing venture as the name suggests. Optimized for readability and equipped with parallax scrolling to ensure a great design, this theme is SEO mastered, and has amazing options panel and shortcodes to customize your site as you need. 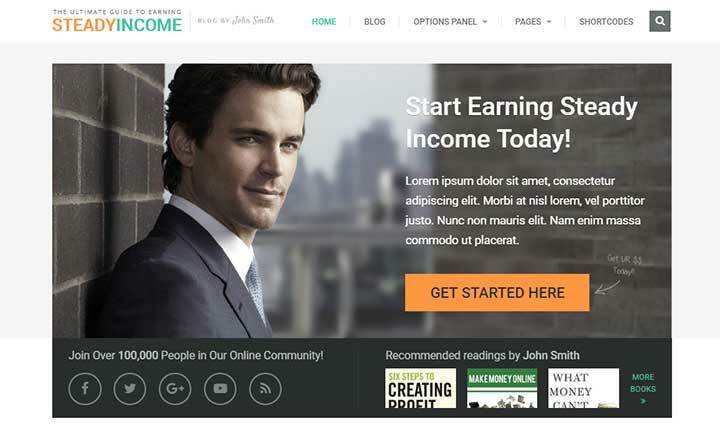 So, if you are a writer, artist or designer and need a theme for your latest project, SteadyIncome is a good choice if you are looking to enhance the user engagement with unlimited colors, typography and built-in ratings with a one-click install. If you are a professional speaker or a passionate coach and are looking to inspire people by spreading your knowledge, the Coaching WP theme is one of the few coaching themes in the market that will save your time and money. It is based on the WooCommerce and LMS plugins and allows you to sell your content online to learners worldwide. The ideal Speaker and Life Coach WordPress Theme, Coaching WP offers your site a professional look with unlimited color schemes and carefully designed multiple pages and header layouts that work on all screen sizes and devices responsively. Not only this but Coaching WP is also equipped with special effects and animation, event management options and RTL and WPML support to make your site more accessible and user-friendly. The Author Pro theme is the go-to WordPress theme for published authors who need a minimal yet intuitive design to create an online library of books. Equipped with elaborate design and effective functionality, it is the most professional way to display your work and ensure that users are attracted to your website. The best thing about the Author Pro Theme is that the unique color styles, custom backgrounds, and custom headers. This WordPress writers theme is based on the WooCommerce plugin which enables you to make your online store more powerful. Offering a unique landing page and a mobile responsive design, the Author Pro Theme is a perfect fit for authors who need an online library to display their work smarty and sell them professionally. Ideal for professional writers and authors who need a simple, clean and minimalistic theme for their WordPress blog, the BuzzBlog theme is a multi-purpose theme that works great for individual blog sites and portfolios. Easy to install and customize, if you are new to the blogging world, and want to spread your stories to the world BuzzBlog is a perfect choice. Some of the features that make BuzzBlog a great WordPress authors theme are the powerful admin panel, high-quality design, blog, post and page layouts, and social media icon integration. The best thing about BuzzBlog is that it offers you with more than ten exclusive demos to try your hand at the theme well enough before you begin to set your style. One of the highly demanded WordPress themes for writers, authors and content marketers. 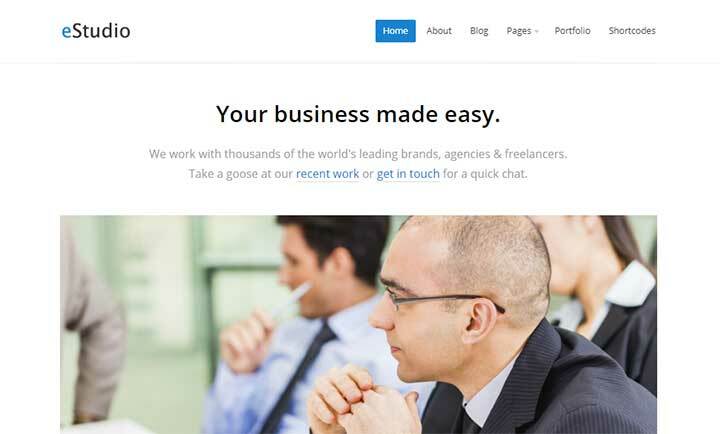 The professional Tabor theme is an effective way to attract viewers to your website. Fully compatible with Gutenberg, the incredible Tabor theme allows you to create rich content in WordPress with easy editing options. Moreover, Tabor seamlessly integrates with all the social and content-specific WordPress plugins like Yoast SEO, MonsterInsights, OptinMonster, Medium, MailChimp and Schema that are essential to deliver your content and boost your online presence. In a nutshell, if you love writing, then the combination of Tabor and Gutenberg is exactly what you need to take your dreams to the next level. 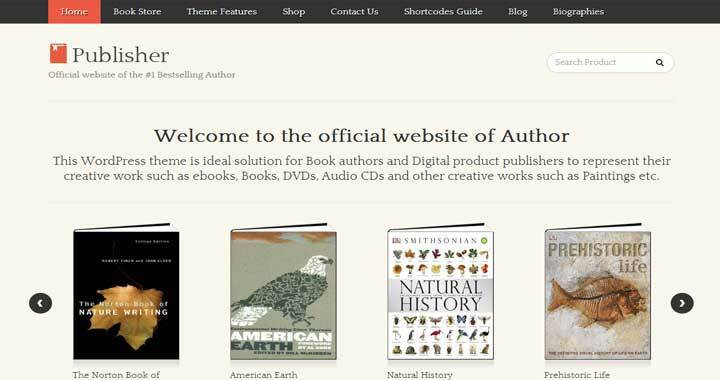 One of the easiest and highly customizable WordPress themes, the Book Author theme has been specially created for authors, publishers, and writers who want to sell their work online. 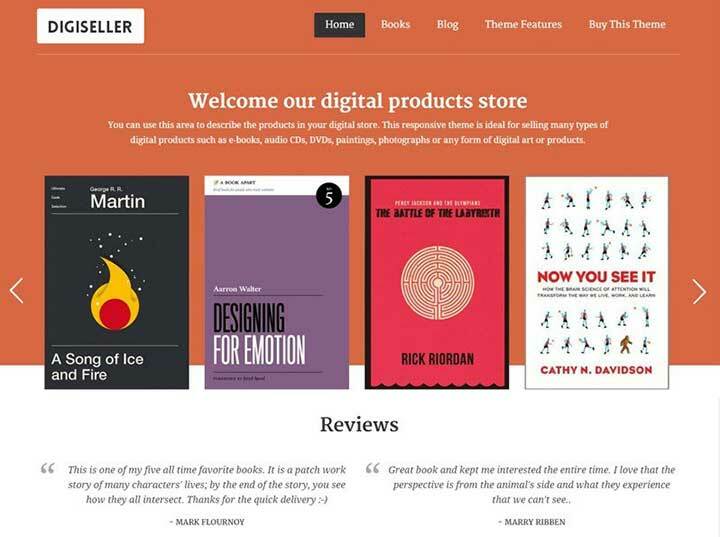 This WordPress writers theme is so powerful that it creates your bookstore with an easy one-click option within seconds. This WP theme for writers is highly responsive and ensures seamless display across all screen sizes. It also offers different customization features that help you to categorize and sell your products with exclusive widgets and sliders. 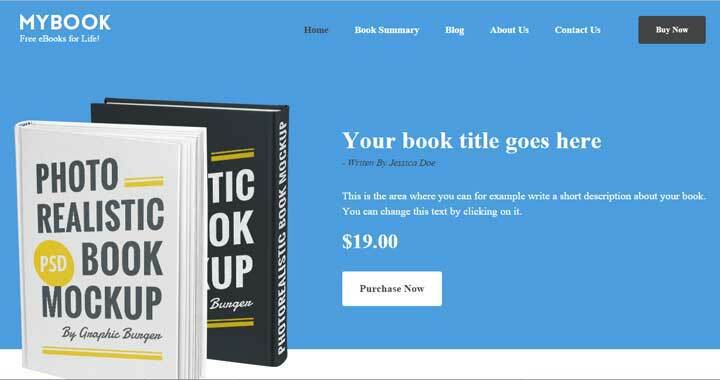 The Book Author theme is not a theme but an easy-to-customize online store where you need to put your products and promote your website without worrying about the technical process. The Publisher theme WordPress theme is an incredibly classy theme for writers, authors, and even publishers. Regarded to as one of the most optimized themes for publishers, it is the perfect way to create, showcase and sell your products on the internet. Designed with a simple user interface, this theme emphasizes the importance of simplicity and minimalist design to attract users and engage them. Even better, you can create a website with the Publisher theme within a few minutes. Based on a powerful plugin like WooCommerce, this theme combines design and features to deliver a delightful experience for your users in the simplest of ways. One of the most highly demanded themes in the market, the Maker Pro Theme is the best way to conceptualize and create your learning platform, reader’s portal or online library. In fact, due to the multiple colors, settings and background images, it enables you to get optimized results from your site. 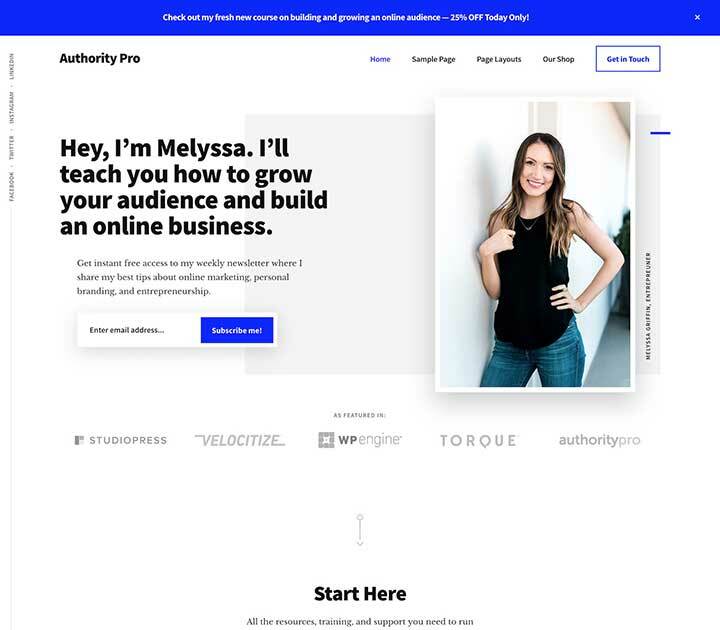 The Maker Pro Theme also offers pre-defined templates like Default, Archives, Blog, Landing, and Full Width to enable you to create different layouts for your pages and posts. This WordPress writers theme is also fluid responsive that leaves it optimized for every browser, device, and screen size. Moreover, it offers easy customization with many elaborate widgets and sidebars. Infinite is a WordPress theme, from Themify, that allows you to display all your posts endlessly on a single page so that the readers can view all your posts while scrolling down. A highly engaging WordPress writers theme, it helps readers to see all the content in a better way. If you think, this is not a good idea; then you must know that popular editorial sites like Forbes, Vogue, and Mashable all run on the same design. This professional theme for writers is equipped with features to drag and drop banner ad spots, sticky headers, slide-out widgets. Moreover, this theme is based on the powerful WooCommerce plugin, that ensures you get a professional theme with a minimal yet beautiful design. Cyprus is the perfect WordPress theme for authors, writers, designers, and artists who are looking for a theme that not only offers elaborate and beautiful designs but is also easy to work with. Supported by a simple drag and drop builder, it also offers delectable layouts for both posts and pages giving you greater control over your website. The best thing about this theme is that it has been developed with an aim to engage users. This is why its professional design has made it one of the most preferred options for marketers and entrepreneurs too. In a nutshell, the clean and user-friendly design makes the Cyprus theme an optimized option for your next website. It is also highly responsive and ensures faster page loading speeds. Ideal for lifestyle, fashion, beauty and travel bloggers, the Feminine theme is a beautiful theme that has been designed aesthetically for a girly look. The colors and the typography options ensure that you can create the most of the easy drag and drop builder. The uniqueness of the theme lays in the appealing Instagram section and the elaborately designed portfolio layouts. This WordPress theme for writers is also loaded with three uniquely designed post and slider layouts that offer high customizability and freedom to personalize the website as per your needs. Equipped with authentic signature support, the Feminine WordPress theme for Writers is ideal for all types of feminine blog concepts and allow you to shape it as per your need with unlimited customizability options. Offering a retina ready and responsive design, the Read WP WordPress Theme is a distraction-free theme that emphasizes the importance of readability. Developed by keeping in mind a minimalist design to enable undivided attention of the user, the theme is compatible with all browsers and supports all post types and formats. This WordPress theme for bloggers also offers unlimited portfolios, self-hosted audio and video files, browser compatible form elements and more than 20 social media icons. What’s better is that it is translation ready enabling quicker adjustment. The custom settings panel in Read WP makes customization easier with three blog layouts, unlimited sidebars, header, and unlimited font options. So, if you do not have any coding skills but prefer perfection in everything, Read WP is the perfect choice for you. As the name suggests, the Elegant theme is a sophisticated theme that makes your blog looks classy and increases readability by focusing on the content. It eradicates all futile animations and graphics from your site to enable a hassle-free experience to the readers. One of the best WordPress themes for writers indeed. Developed with a minimalistic approach, each element of the theme ranging from typography to the ease-of-use has been created with great attention to details. This is why it helps to generate stunning visuals with easy drag and drop builders. The unique thing about this WP writers theme is not only its design but also exclusive features like Portfolio and Team post types, new image filters and both masonry and grid layouts. In a nutshell, elegant theme is an ideal theme for individual portfolios, writers, artists, and editorial sites. The powerful Efor theme is a premium tool if you are looking to create and sell online courses on WordPress in the simplest yet most effective way. It has been specially designed for coaches; the SEO-enabled theme allows you to attract new trainees and grow your email list. It is based on the Elementor Page Builder and supports over 70 elements. Powered by LearnPress, the Efor theme has a graphical appeal with stylish popups and a responsive design that makes it different from its counterparts. The WooCommerce compatible theme also allows you to be flexible with the images and videos you use n your website. If you need a website that supports different blog layouts, offers header variations, unlimited sidebars, forms and has exclusive support, the Efor theme is one of the most effective ways to sell your content. Created specifically to enable an exquisite sale of books for writers and authors, the Odrin WordPress theme is a modern and elaborately designed theme for experienced as well as inexperienced writers. The best thing about the theme’s design is the beautiful page flipping effect that makes it an appealing option for the readers. Supporting WooCommerce, it has also been equipped with many essential and innovative pre-built templates and shortcodes, that makes your website the perfect platform to sell and launch your books. Odrin is dedicated to bookselling and allows high customizability to sell books online without the need of any coding skills. So, if you feel your words need wings, try the Odrin exclusive demos today. Literatum, as the name suggests, is an innovative and creative theme for bloggers or writers that want to develop their online journal. It offers sophisticated designs that are clean and modern, simple navigation and helps focus the reader’s focus on the important content on your site. The best thing about the Literatum theme is the interview support feature. This feature enables users to add comments on a particular sentence in your article just like it happens in Medium. A highly engaging and effective Theme, the Literatum WordPress theme is a powerhouse for authors and writers who are looking to achieve greatness with an easy to use and a highly customizable website. The Gutenberg-compatible and regularly updated professional theme “Akea” is a minimal WordPress theme for bloggers, writers, and artists. 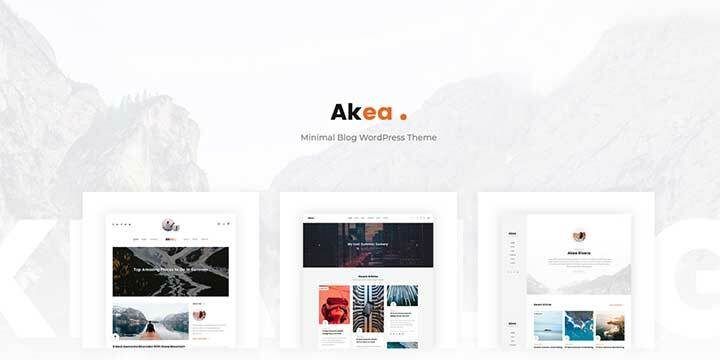 Developed especially for minimalistic blogs, the Akea theme comes with three built-in homepages with many posts to make working on the design even easier. A highly customizable theme, it is loaded with hundreds of colors to pick from, high-quality demos, and easy drag and drop builder options to leave an impact on the viewer. The best thing about the Akea Theme is that it is equipped with an advanced admin panel that offers a wide variety of useful features like live customizer, auto updates, unlimited sidebars and different display layouts for blogs, pages, and your site gallery. Brittany is an incredible blogging WordPress theme for writers. This theme is specially created for fashion bloggers, lifestyle bloggers, and writers. It believes in giving a smooth reading experience. This theme allows you to combine all your posts, page and column layouts to unique appearance. You can also choose from 30 color and typography settings. 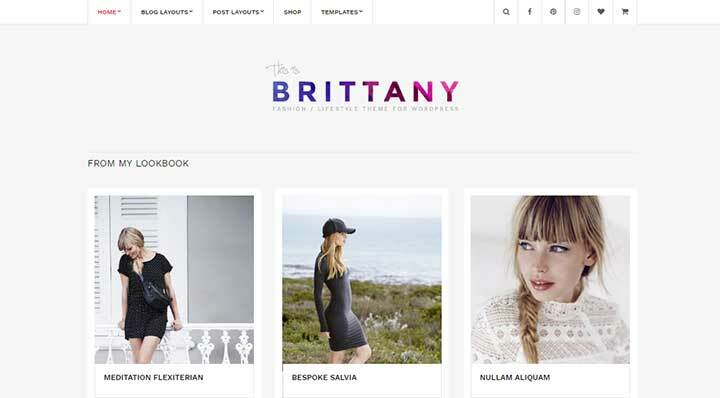 Brittany also supports WooCommerce plugin which helps you to create a powerful E-commerce website. Furthermore, it also allows you to share your content with social integration options. Other amazing features of this theme are One click demo import, Easy customization, Speed Optimization, WPML compatible and more. The Academy Pro theme is ideal for people who need a professional education portal to sell courses online, enable memberships on their website, or need to market their educational content in an organized way. In simple words, this theme is an easy way to gain subscribers and marketize your courses effectively on the internet. This WordPress writers theme is also ideal for people who have no coding skills and need an easy drag and drop functionality to customize and create their website. Based on the flexible WooCommerce plugin to allow you to easily set up your online book or course store. You also get exclusive widget areas and customizable headers, with a mobile responsive design enabling maximum optimization of the features and functionalities of your website. A creative portfolio theme for freelancers and businesses, eStudio allows you to create a stunning website. This theme offers a variety of extendible features which enable you to upload and share your work online easily. eStudio also comes with Featured Content Slider to allow you to display your content in an auto-scrolling slideshow. 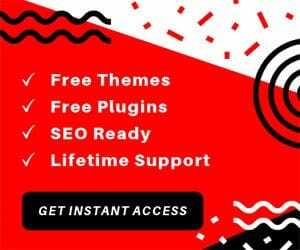 Other important feature of this theme includes Multiple Content Layout and an integrated library of shortcodes which allow you to showcase your content in the best way possible quickly. 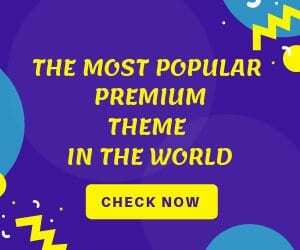 Moreover, this theme is also Easy to customize with a powerful slider, regular updates, Grid layout, blog layout, custom logo, custom colors and a lot more. Parole 2015 offers a simple, clean and minimalistic design for bloggers around the world. The best thing about this theme is the easy theme customizer that lets you create professional blogs with effective typography and increased readability. Not only this but the Parole 2015 theme is also SEO optimized and highly responsive, which makes it suitable for all screen sizes. You can play with unlimited colors, blog styles, page layouts, and other important features. Since color forms an important medium to attract the viewer, elaborate color options have also been introduced that allows you to change the color of the links, link hover, menu, background, header, and even the sidebar. Even popular than Twenty Fifteen was the next version of the WordPress default theme called Twenty Sixteen. 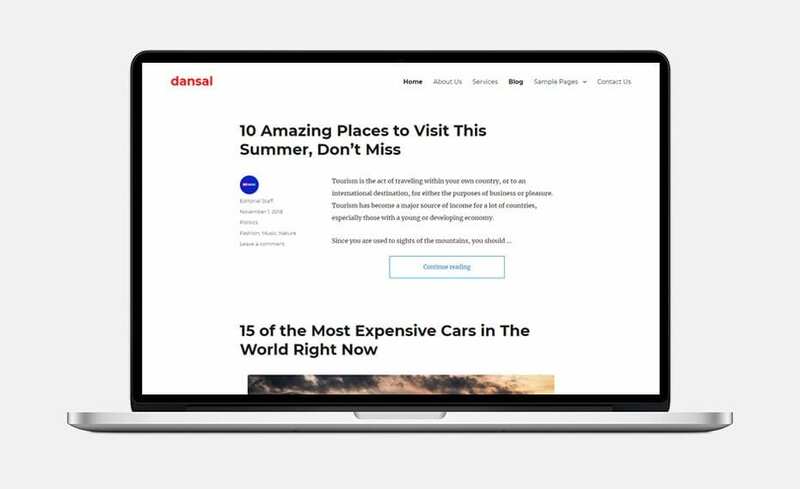 Based on this incredible theme, Dansal, a child theme was developed specially for passionate bloggers and writers looking to make a name and tell their story to the world. Completely responsive and dynamic in its usability, Dansal has almost all the features and functionalities of its parent theme and works seamlessly across all devices and screen sizes. The best way to make sure that each of your blogs looks better, enhanced and cleaner than before, use this flexible WordPress theme for writers to enable a user-friendly interface on your website. Any Other WordPress Theme For Writers or Authors? So, this was our top pick on the best WordPress Themes for authors. With the help of these themes, you can easily start a blogging website with a wide range of customization possibilities. Moreover, these themes offer features that can help you enhance the functionality of your website in a much friendly manner. 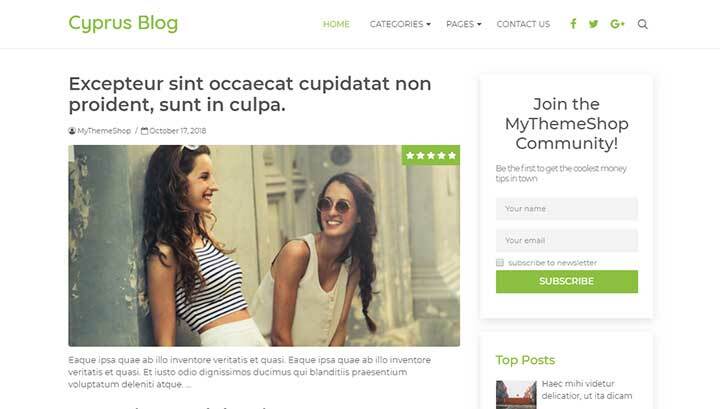 We hope you liked this article on Best WordPress Themes For Writers. Please drop your recommendations and suggestions in the comment section below. Well, your listing WordPress writers themes are really cool enough. I already tested the Authority Pro and Coaching WP. The WooCommerce and LMS plugins of these themes was really helpful for me. Also, I learned about BuzzBlog from your post. Will try this out next! Thanks for sharing!